One of my teachers in high school claimed to have been babysitter to a young Stephen King. He told us that even as a boy, the best-selling author of horror was a "weirdo." I wasn't completely convinced that his claim to have known Mr. King was true because he was drunk most days of the week, and therefore spent the better part of class time wandering between moods of nostalgia, indifference, and belligerence, and lecturing us accordingly. I read a lot as a teenager, but I didn't read any of King’s books. The made-for-TV adaptations of his works were a series of cheesy disappointments that didn't send me running for the library to check out an armful of them to read. It wasn't until a vampire drove Elizabeth into my arms that I took an interest in the "weirdo's" macabre scribblings. The next movie that we watched together was suggested by Elizabeth herself, with the disclaimer that it had always frightened her to a thrill. I began to realize that she wasn't anything like the girls I had been running with, and looked forward to sitting beside her when she got scared. 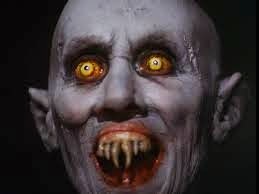 “Salem’s Lot” is another of King’s TV adaptations, and although it is dripping with cheese, if you watch it in the dark after the sun goes down, it leaves a mark on your soul. (You’ll please excuse the pun; David Soul of Starsky and Hutch fame stars as the hero.) There are a few terrifying moments spent with the vampire, but the best is when he confronts the family’s priest, who has come to talk sense into the teenage son that believes that a vampire has come to their small town. Moments after the mother tells her son that “nightmares seem real,” the creature rises from the floor like a black curtain of death hoisted by Satan himself. The pale undead skin of the vampire’s face stretches tight over his ancient skull, his eyes glow bright yet lifeless, and his fangs appear as a work of disgusting, terrible, yellow beauty. Elizabeth sought shelter in my puny arms, and I have loved that vampire ever since. After watching “Salem’s Lot,” I read a lot of Stephen King’s books. I liked most of them, and learned a greater appreciation for him as a writer. Prolific, yes, terrifying, yes, twisted, most definitely; the drunken declarations of my High School teacher seemed very plausible. Stephen King was most certainly a weirdo, but he was a weirdo that I could admire. Years later, Elizabeth began to tire of my own constant and vocal wishing to someday become a writer. The trouble was that I almost never wrote, and when I did it never amounted to more than a page of dreadful musings. Having no writing discipline, I had no claim to the title of writer. Her words were not harsh in their honest delivery, but still I felt hurt and humiliated for a moment, before realizing that she was right. I didn't start writing, but I did take to thinking more about the actual writing process and promised myself that I would start writing very soon. I just needed more time. But I wasn't allowed any more time. Elizabeth didn't stop with her demand that I pen up or shut up. She found a local writing group that met every month at the Wiggin Memorial Library in Stratham, New Hampshire. And then she had the nerve to make me join it. I wrote a story about "durt" and the group loved it, in spite of it being almost fifteen pages of terrible writing. They voiced their praise along with a few edits, and in one hit the writing group became a drug. I couldn't wait for the month to pass so that I could get my next fix. I started to write almost every day, even if it was just a few lines at a time. Still, Elizabeth didn't stop there. She also bought me a book; a book about writing, written by Stephen King. More a memoir than an instructional text on how to become a writing legend, the book put my dream into perspective and inspired me to keep at it. I was encouraged to learn that Stephen King had not just fallen out of the black sky at midnight with an armful of pre-written best-sellers and a fat stack of cash in his backpack. No, he didn't succeed out of nowhere; he labored at it. He wrote. And wrote. And wrote. And while he wrote he lived, and while he lived he worked, suffered, loved, laughed, cried, survived, and went a little crazy. But through it all, he wrote. Even after being hit by a car and suffering debilitating injuries that left many unsure as to his continued success as a best-selling powerhouse, he wrote. So I kept on writing. And while I wrote, I lived, and while I lived, I suffered, loved, laughed-you get the idea. So I wrote. And went a little crazy. Crazy enough that it came time to move. We needed to find some happy in a new and unfamiliar place, a place where we could drive for miles without passing the dark forest where we had found Jared. But halfway through our move west, with houses nearly sold and bought, I started to panic at the thought of leaving a successful business, a beloved neighborhood, and a number of dear friends for a new life which promised no certainty other than challenge. Elizabeth's response over the phone while house-hunting 2,500 miles away left me with no doubt that we were doing the right thing. “If we don’t go for it now, we never will,” she declared, adding, “I want you to come to Oakley and take a break. No job, no worries, just writing,” she said. “But-“ I began to worry at once. “No buts!” Elizabeth sliced my worry in half with a gentle shout. “We’ll make it work. I’ll find a couple of jobs if I have to. Enough already; you need to finish this book! If you don’t finish it now, you won’t ever finish it, and then you’ll always wonder if you could have done it, and so many people will never hear Jared's story,” she concluded. So we moved to Oakley. I finished the book. 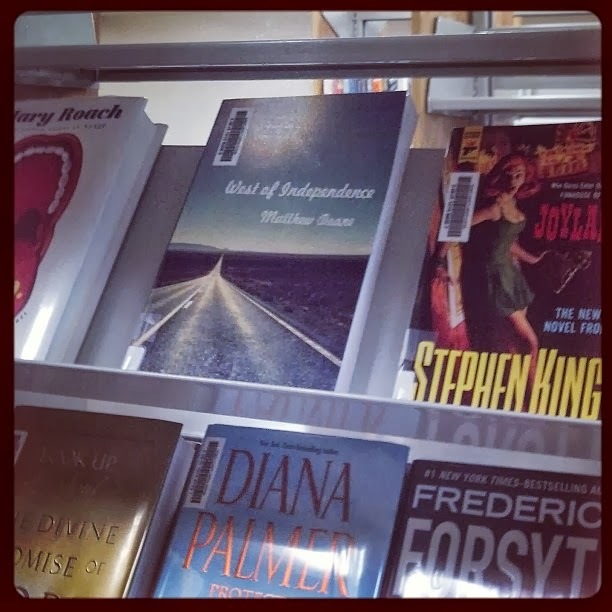 It’s called “Westof Independence.” That’s it in the picture, sitting on a library shelf beside one of Stephen King's. 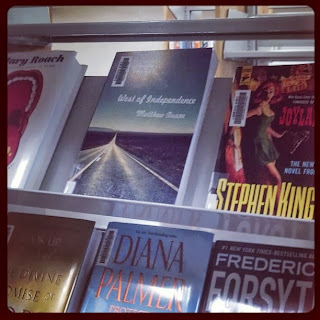 So I write, but not to have my book(s) beside Stephen King’s. I write because I love to, even when it’s hard to. I write because it gives so much back to me, even when the readers are few and the sales are slow. I write because my little brother Jared died of loneliness, and I feel terrible at how I treated him, believing that he would always come back to hug me and hang out with me in spite of my abuse, self-righteousness, and callous indifference to his suffering. I write because I want my kids to know that no matter how impossible your dream, you have to try, because if you don’t try you have already failed. And I write because a vampire chased a beautiful woman into my arms.